...again! For the second time in as many years, National Geographic Traveler Magazine has honored Global Basecamps by naming our tour as one of their "50 Tours of A Lifetime" for 2015. The tour in question is our "Myanmar & Southern China: Places Unexplored." We're so proud! There will never be a better time to see Myanmar; in five years, it will be transformed through the tourism boom it is experiencing today. With that in mind, this itinerary takes you through Myanmar's highlights, as well as places seldom-seen by western tourists. To continue this theme, we then visit China, specifically traveling to places untrodden by thousands of tourists, to connect with a side of China less influenced by western culture, and more authentic to China. 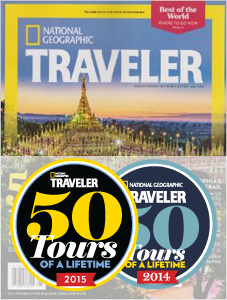 With a big thank you to National Geographic Traveler Magazine, we will start looking forward to next year! We're going for the hat trick!